One Day Makeover: Staging Powder To Sell In Just 8 Hours For Under $150! Today, I show you how this cavernous powder room got a complete facelift, without new paint, in just two hours and for less than $150! Powder rooms are so challenging. They're tiny. They often lack any natural light. They're usually near the front entrance and they have a toilet in them! Nothing says Imagine your life here! like a dark, musty room with a poop bowl in the center. They're the last places we want to tour or photograph because they're just so foul. In a full bath, we can treat the toilet as an aside. Enhance the bathtub and the shower. Create the illusion that only relaxing, spa-like activities happen here. But a powder room? There's no avoiding the purpose of that room. Staging and decorating these very utilitarian spaces is hard. So hard, in fact, that most people don't even bother. I've complimented my host's powder room wallpaper or mirror and heard "Oh, that was here when we bought the house" so many times. What a bummer (pun intended?). Joking aside, this is a room in your homes, people! It deserves to be a reflection of you as much as your other rooms. So, in the coming weeks, we're going to tackle it. 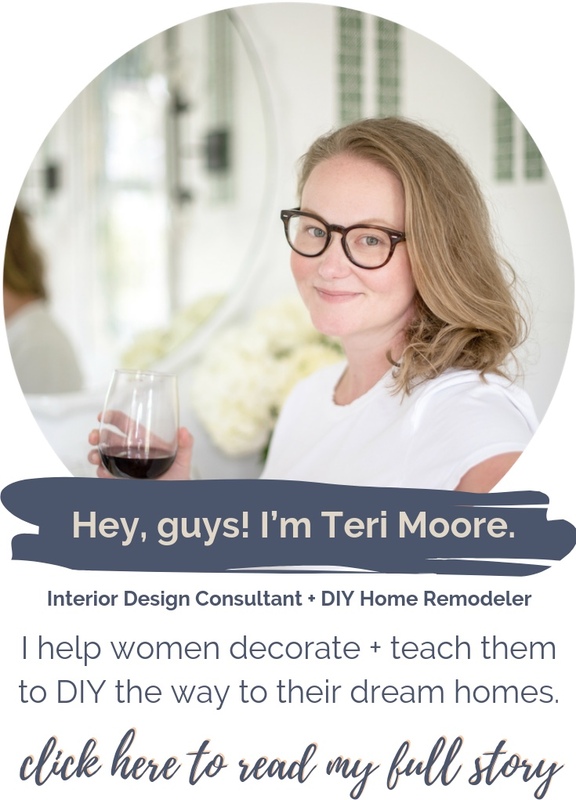 I'm going to show you how you can completely transform a powder room from a space you don't even want guests to see into a showpiece that will (almost) make you forget the commode. And I'm going to break it down, step by step, so you can see exactly how I get from Point A (ugh) to Z (point YAY?). gold is for kings and this is my throne. Staging a space for real estate sale can be expensive, but it doesn't have to be. Unless you've got an endless budget, you're probably wondering how you can dust things up a little to better appeal to buyers without spending a fortune. If you that's you, be happy to know that I'm going to show you how to take this mess of a room and update it for today's market for less than $150. The room won't feel overall transformed in the end, but it will be less likely to detract from your overall listing when buyers peek inside. If it's not permanent, take it out of the room. Leave behind no curtains, rugs, mirrors, artwork, or trashcans. Only the toilet, lighting and bath fixtures, and sink can stay. Here's why: Our homes tend to accumulate items over time. As a result of this slow accumulation, we start to see only the larger scale of the room - the overall look, if you will. Our eyes become so acquainted with the small items that we become blind to them. We forget they're even in the room. A soap dish can feel like a fixed piece after five years but it's NOT (I don't know you, so this is an assumptive statement, depending on how much build-up there is). Don't fret! Just because I'm telling you to take it out, that doesn't mean I'm going to make you throw it out. I just want you to see the bare bones of the room so you can better determine what's allowed back in. We'll get there in a minute. First, let's talk about what's not great with the powder room above. The area photographed above is roughly 2 1/2 feet by 1 1/2 feet and within that space, there are eight items (not counting the shelf, toilet, or sink) and three of them are air fresheners. I get it. I totally do. But you must know that having multiple candles or a visible container of air freshener just conjures images of all manner of sins performed in this room. One candle is nice. Three candles means you need to see a doctor. Only one candle is allowed back, if any. And that candle should be lightly scented in a "clean" fragrance, like linen sky or spring bouquet. No vanilla, apple, cookies, or otherwise food-related scents in the bathroom. Because no guest ever is going to compliment you on having a bathroom that smells like Starbucks. Trust. Speaking of images being conjured, let's talk about bathroom books and magazines. I know everyone has them. I've even seen products marketed for the sole purpose of storing them in the bathroom. And if you want to read on the loo, who am I to tell you no? But seeing reading materials in the bathroom always brings back memories of my childhood home and my father's Sports Illustrated. And I can't be the only person in the world who has this. So, bottom line (haha. this is killing me): If you want to sell your home for top dollar, remove any object that might associate scent memories. Books/magazines are out. If you don't have a place to store your toilet paper, take it out of the room. If you have tissues in the room, take them out. Same for sanitary products (yes, I am a feminist and yes, I keep a jar of tampons in my guest bathroom). For our general lives, these items are necessities. For selling a home, these items are clutter. Yes, your grandmother's needlepoint tissue box is adorable. You can display it in your next house, once you get. that. money. For now, pack it up. To be honest, I've seen a lot worse art in bathrooms. Think: food. But still, there's a lot going on with this art that needs to be addressed. It's dated. It's dirty. And it's hanging incredibly wonky on the wall. Side note: Your picture hangers (the nailed-in piece that actually grabs the holder on the back on the art) should never be visible. They come in a million different sizes. I see this all the time in clients' homes. So I'm just gonna say it again, they should never be visible. Your art should look like it's floating on the wall, being held up only by a refusal to accept gravity. Because powder rooms are very small spaces, it's important to minimize the number of "breaks" you see. A break is any time the wall meets with a new object (frame, mirror, toilet, etc). In this instance, having three small pieces of art seems like a good idea because it is a small space (and the art matches the wall color, etc), but it's actually just creating a more cluttered look. And small spaces can't handle clutter. So, buh bye, art grouping. I bet you thought I hadn't even noticed. These walls are very green and also have a glossy paint treatment. Coooool. Y'all. Even the ceiling is green in this bathroom. EVEN THE CEILING. For future reference, don't do that. Don't take a tiny, poorly lit space and paint the ceiling. I know Oprah says your ceilings should be painted, but there are exceptions to every rule, which means sometimes Oprah is wrong. You can repaint the bathroom if you want. Paint's pretty cheap ($40 a gallon standard). But I told you we were going to do this for under $150 and that $40 (plus supplies' cost) will kill a third of my budget. So while I definitely would recommend you repaint it if you were my client, I really want to show you how to update and modernize what feels like a desperate space with minimal output. Trust me. You're better off to paint over any extremely taste specific colors or patterns. But I like a challenge. So let's stage this space without repainting. Give this space a legitimately good scrub-down while you have everything out. legit - how many shades of green can we fit into one powder room? Staging A Powder Room, Step Two: Add Back. After all of my editing in Step One, I'm left with two items from the original bathroom. You might have more. I have two. A soap dispenser and a hand towel. I like neither and here's why: The hand towel is worn and tattered and the forest green screams I used to live with fairies! and the soap dispenser has a top with a finish unlike any other is this room. The toilet paper and hand towel holders are both satin nickel, as is the light fixture. The soap dispenser is oil rubbed copper. At the end of the day, how much would replacing these items cost? $15 - $20? Is it worth it to you? It is to me. So they're nixed. When adding items back, ask yourself a few questions: Does this look current? Is it something I could walk into a store and find today? Is it clean? Is it torn? Does it match? If you can answer "yes" to all of those questions, you can keep them (for now). Staging A Powder Room, Step Three: Source. Do you like to shop? I do! Here's the fun part. We're going to look at the current fixed items in this room and figure out how best to incorporate them into a modern design. For me, that means I need to determine what current color palette works with sage (pea soup?) green. So let's talk about the color wheel. Remember Art Class back in elementary school? No? Just me? K, cool. So we learned that complimentary colors would appear opposite one another on the color wheel. I want to locate the closest shade of green on the color wheel and then look directly across to see if anything is popping out as "current". Please note: Staging your house can be all about current trends (just, like, take it easy). I don't recommend using trends in your long-term decorating. But for staging, it's almost a given that your buyers will swoon over Whatever Is The New Chevron. So I've located my green. It's centered within the head of the lady in the drawing. So I can choose any colors within that skirt. And I really like this dusty pink (Millennial Pink is what the kids are calling it these days). It's very on-trend and looks great with green. So now it's time to shop. So, the first 3 are a given. But let's just quickly go over the last two: every room requires one of these items to be considered a complete room. A natural element can be a wooden accent piece, or a plant. A furniture piece is, well, have you heard of stools before? My goal is to find a stool that is made of wood and therefore fits both bills. Time to shop. I source from all over the place, but I always start with online shopping (except for art, which I prefer to buy local). If I can't find what I want there, I move on to stores like Home Goods and Ross. You can find all of my favorite home decor items and shop everything in my home here. Pick a site. Go there. Search "pink art". See what happens. Wow. Wayfair has over 43 thousand results. Sort through that. Ha! So this is where I have to kind of throw in a pitch for working with a professional. If you aren't accustomed to the stocked merchandise at most suppliers, you're probably going to have some challenges. But it's not impossible to source art (or anything!) for yourself. If time is a concern, you'll just have to apply filters to be very, very specific about what you need. Also, don't forget to sort by lowest to highest price. Once you're out of the $60 range, you can stop looking because anything more than that and you've BLOWN OUR BUDGET ALREADY. Now, because I'm special and I know a lot about design, (i.e; have a lot of time on my hands to browse stores, catalogs, and blogs... hahahahahahahahahahahahahahaha), I knew immediately upon seeing that dusty pink/coral on the color wheel which art I'd be purchasing. Thank you to my favorite DIY bloggers, Young House Love, I already knew about a piece at Target that I've been obsessed with from their beach house renovation which would be perfect in this space. Art? Check. And since I'm already placing a Target order, I figure I should go ahead and search for the other items I need. I score a soap dispenser in a very pale pink that I love. I also buy the matching vanity cup. Do we need a cup in a powder room? Naw. But I thought it might make a great bud vase in which to store my natural element (see? thinking ahead!). Two and a half items down! Woot woot. Next, natural element / furniture - and I luck out at Wayfair ALWAYS. While I didn't find a stool that was made of wood within the budget (to satisfy the natural element detail), I did find a gorgeous ceramic stool (I scored it for $62, but it's now $88 on Wayfair). Then I remembered I had a lovely orchid I could repurpose in this room. Orchids, guys. I love them. You can buy them at grocery stores and they're so elegant. And I murder them immediately. And murder is wrong. So I opt for lifelike faux versions (here's a good one). As a last-minute decision, I opted to nix the gold. Here's the thing about gold: It's seriously trending for designers and stylists, but I've found that lots of actual homeowners are still afraid to go gold. And I get that. If you grew up in a house with duck wallpaper borders and brass fixtures, gold can still feel like a very dated finish. And if you don't buy the exact. right. finish. of gold, it can still be dated. So, this is an instance in which I advise people not to follow trends for staging (but if you love it, do it in your long-term home!). A quick 45 minute spray paint job (on a sunny day) brought this mirror back to black. I also moved the hand towel ring to the wall above the sink. This serves two purposes: displaying a cute, new towel, and it allows the sight line to flow properly. The previous placement allowed for the towel to jut out, obstructing the mirror a little. Since this room is small, it's best to keep as much action as possible on one wall to insure sight lines are clear and keep the room feeling bigger. The space isn’t completely overhauled, but it does look so much better. Buyers are going to be less concerned about the work they’ll need to put into this space, for sure! UPDATE: This powder room has gotten a total transformation! Since the original blog post on this space, we decided to completely transform it. I just couldn’t live with those green walls any longer. Here’s the full post on my Powder Room Makeover, which was even featured by Apartment Therapy!